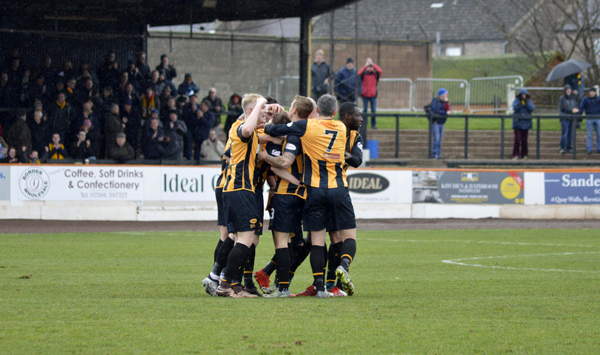 Both sides finished with ten men and the lead changed hands thrice as Berwick Rangers beat league leaders Forfar Athletic by the odd goal in five. Prolonged daylight meant the floodlights remained switched off for a match in which the first offside flag was raised as late as the 44th minute and there was only one other such decision during the remainder of the game. Berwick gave a first SPFL start to defender Renne Donkor and the even more recent loan signing from Hamilton, Sean McKirdy. Rangers produced the first serious move of the match when Euan Spark, Gary Phillips and Steven Thomson linked but Thommo’s cross from the bye line went out of play. After the teams exchanged free kicks, Rangers drew first blood on ten minutes. Darren Lavery stole the ball from Forfar, moved inside and fired into the corner of the net, the ball travelling under keeper Grant Adam on its way in. Aaron Murrell then took control of a bouncing ball and passed out to Michael McKenna but Adam parried his shot before Jamie Bain headed the ball away for a corner. Three minutes after Lavery’s goal, the Loons were level, David Cox turning Donkor on his way to beating keeper Devlin Mackay. It was a tough baptism for the big Dutchman. Despite or maybe because of the height difference, he had his work cut out up against the feisty Cox. Midway through the half, Forfar went in front. Spark appeared to slip giving Danny Denholm space to work the ball into the box from near the right corner and Josh Peters knocked it home. After Denholm weaved past a couple of Rangers, Thomson earned a yellow card for getting under his legs. When McKenna was fouled, Thomson’s long free kick ended just over the bar as did a McKenna effort when the ball came back to him after Murrell’s shot, which he purposely set up for his right foot, was blocked. A determined run by Lavery, a player reborn these days, was abruptly ended by Denholm’s foul for which he was booked, a sanction which would have greater significance later on. At half time, Rangers brought on Greg Rutherford for Donkor with Spark again switching to partner skipper Pat Scullion in the centre of defence. Rutherford went on to have a hand in both of Berwick’s second half goals which should have helped his confidence after his misses at Stirling seven days earlier. With Donkor gone, Cox began to antagonise other opponents. A melee formed after he laid out McKenna provoking a chorus of boos from home fans on the Ducket, unhappy he only received a yellow card. Later, with the Forfar striker lying on the ground, the referee had words with Scullion but the next caution also went Forfar’s way when Denholm was charged with cutting short a storming run by Lavery up the left on 69 minutes. It meant Denholm got his marching orders for a double booking and a minute later, Berwick cashed in. Thomson, McKenna and Rutherford were involved, the latter sending the ball across the box from roughly the same spot from where Denholm had engineered Forfar’s second goal. The ball bounced off one Forfar man on to the chest of Bain and over the line for an own goal. At this point, the home side brought on a trialist number 13 and a few minutes later, Kevin McKinlay replaced McKirdy. The Accies youngster had shown a good eye for picking out unmarked teammates if a little prone to hitting some passes too hard. The trialist also quickly demonstrated some smart distribution skills, Rangers winning a corner after he put through a perfect pass to Rutherford. 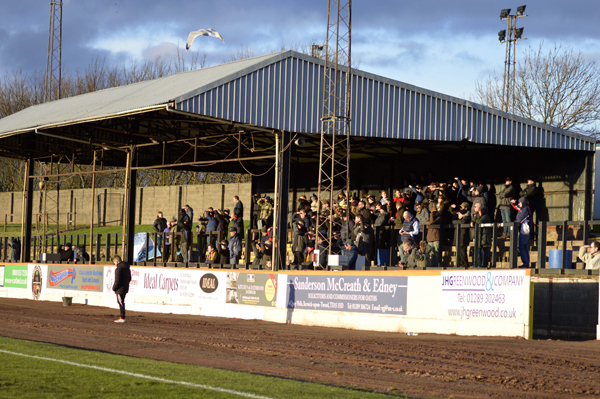 Forfar still threatened. When a high ball came in, Lee Hamilton kicked it off Cox’s boot and then stopped a trialist sub after Lavery misjudged the bounce on a long kick from Adam. Mackay punched away Lewis Milne’s corner before confidently holding a bullet shot from Chris McLaughlin. A couple of minutes from the end of normal time, Rangers put together a slow motion attack featuring the trialist, Rutherford and McKenna but its snail’s pace gave Phillips plenty of time to take up position to finish off when McKenna’s pass came in. 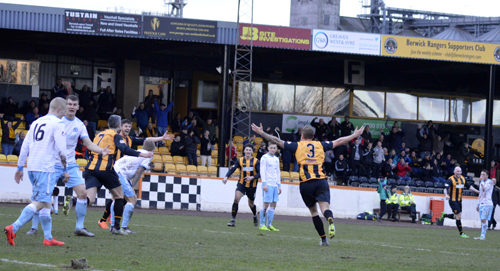 Berwick were back in the lead for the first time in 75 minutes. As if that wasn’t enough late drama, Berwick’s trialist was shown a straight red in stoppage time for a challenge on Tom O’Brien. A vital win for Rangers which moves them up to 6th place ahead of another tough one next Saturday at home to third placed Elgin City who have already beaten them comfortably twice this season.